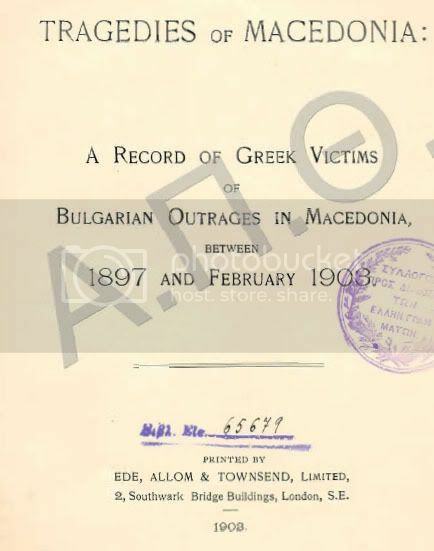 One of the less known aspects of the Macedonian question has been the needlessly Cruel methods and Crimes commited by the SlavoBulgarian Komitadjis against the Greek population of Macedonia. 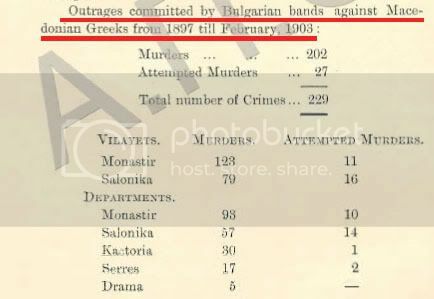 The Bulgarian bands had been notorious for their murders and outrages against non-combatants and especially the Greeks of Macedonia. 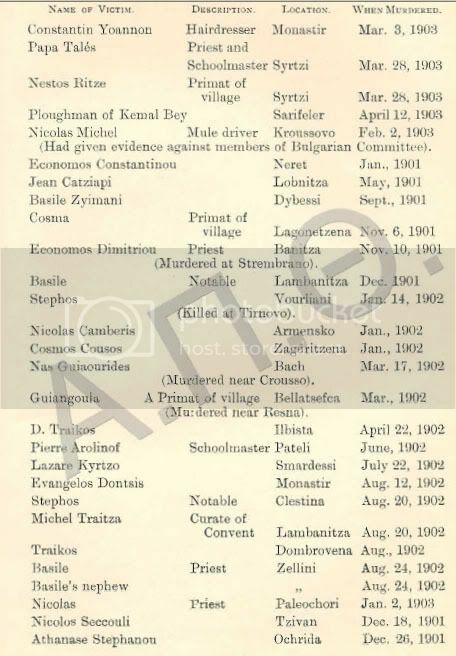 The list is certainly not complete and never will be, since noone could ever count ALL atrocities perpertuated by Komitadji Butchers. 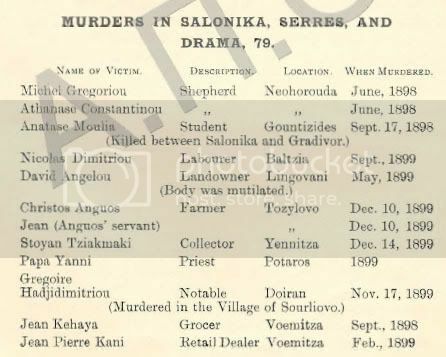 The victims range in social position from the peasant to the landowner and the merchant. 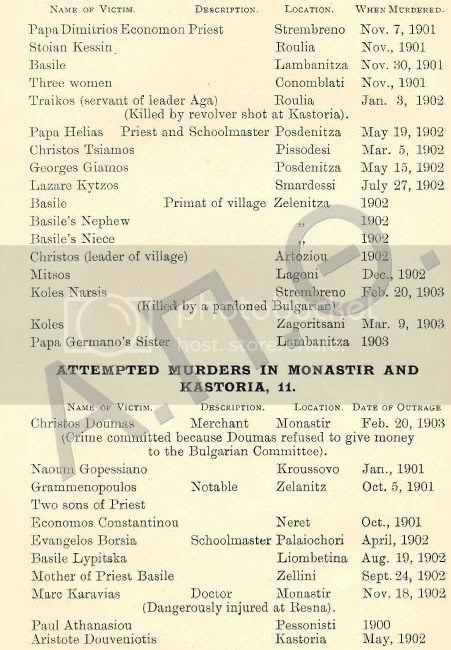 A number of priests are also among the murdered. 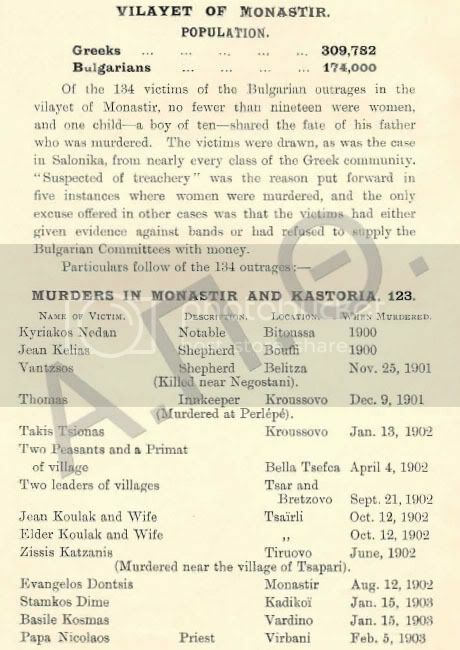 Whole families have been exterminated in some cases while women and children have not escaped from the murdering enstict of Komitadjis. 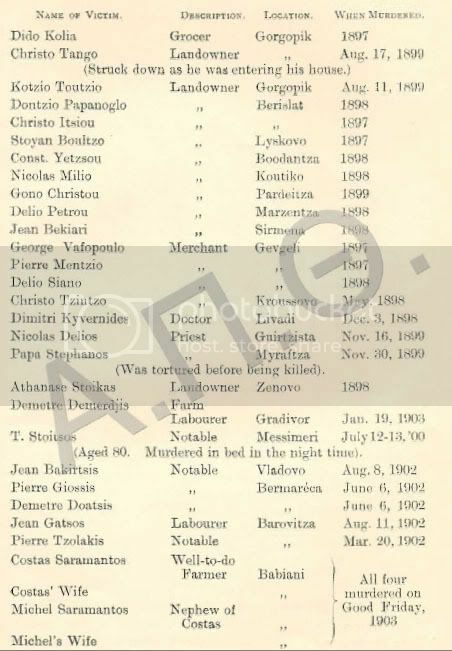 Some of the victims were accused of denouncing the perpetrators of the outrages, and others incureed the hatred of the insurrectionists by refusing either to join the Bulgarian bands or give monetary assistance, but most of those who have suffered death were the innocent victims of a campaign which is being waged neither in the interests of justice nor of liberty. 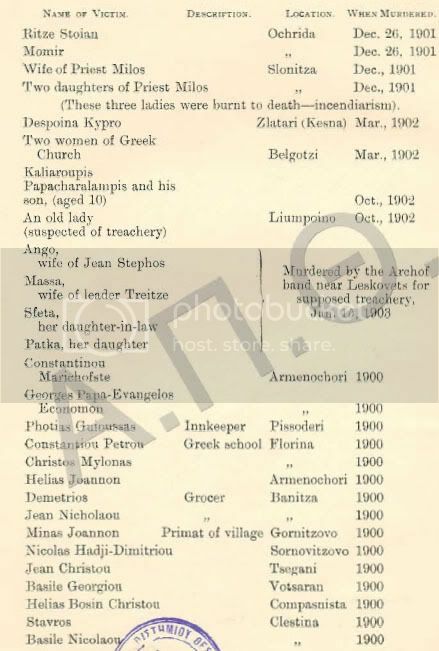 Members of one of the Bulgarian bands entered the house of the Saramantos family from Babiani. 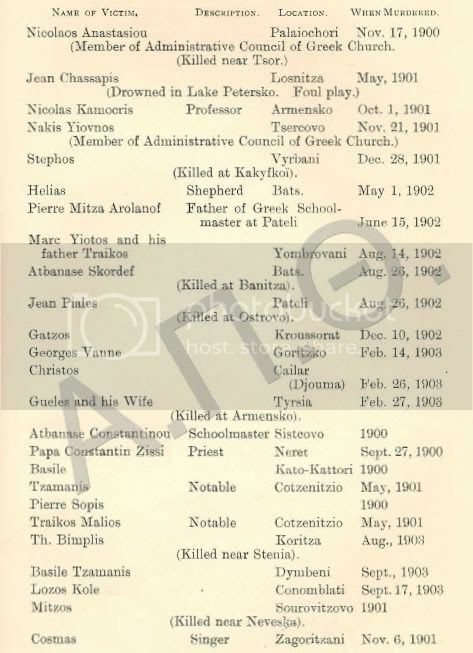 Without explanation or reason given, they murdered Costas Saramantos, his wifein the presence of their son Nicolas and also put to death a nephew of the old man and the nephew’s wife. 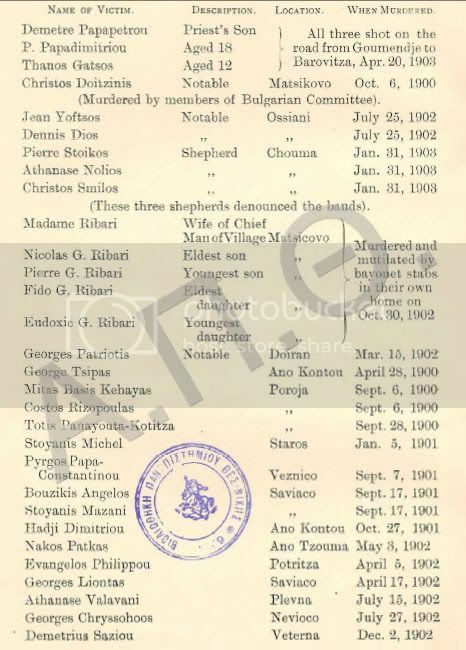 Nicolas was spared only because the Bulgarian murderers required him to take a message to the brigands’s camp. 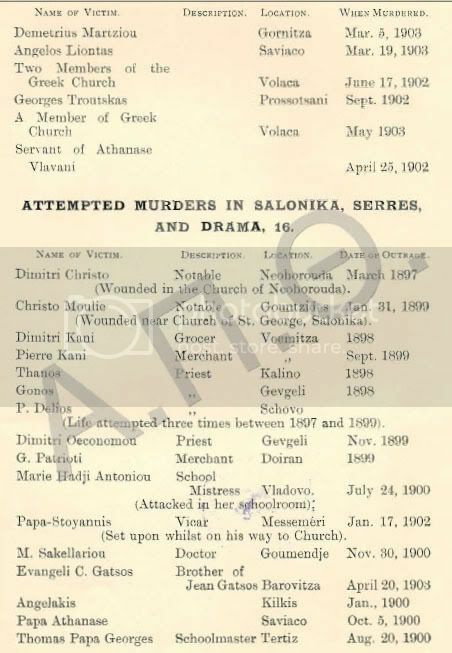 This is a frequent true story reiterated over and over by SlavoBulgarian inhuman criminals against Greeks. An eye for an eye and Bulgaria will go blind.